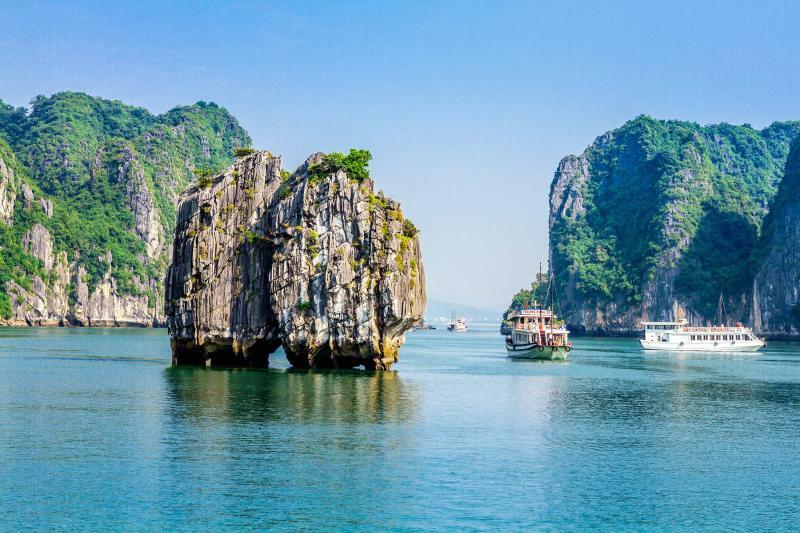 There is nothing greater than witnessing the glowing emerald water of Ha Long Bay or the lasting luster of imperial emperors first-hand. 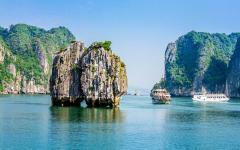 On this 10-day trip to Vietnam you will be introduced to those sites and more, experiencing the fabulous natural and classic splendor within the hidden temples and quaint cities, the magnificent landscape and the friendly people. 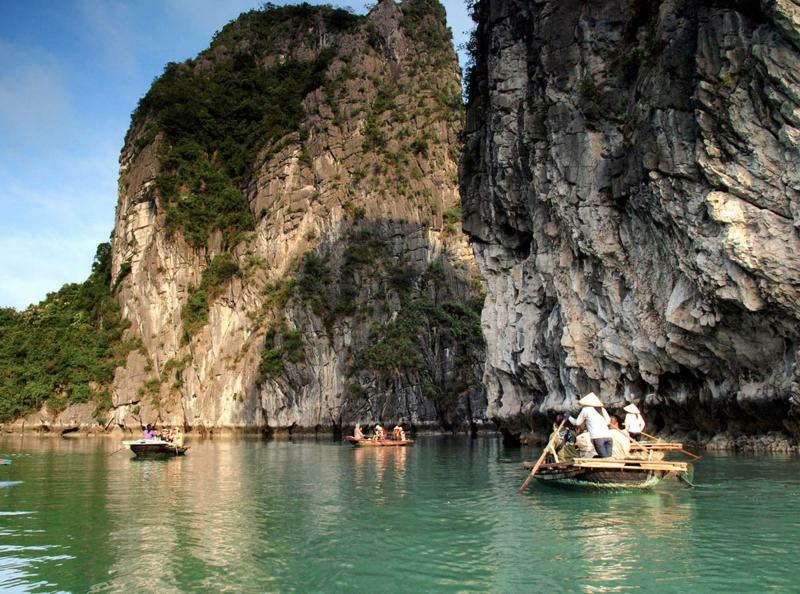 With private guided tours and luxurious accommodations you will have the experience of a lifetime hiking through jade forests, drifting along the Perfume River, and getting to know the eclectic wonder of Vietnam. 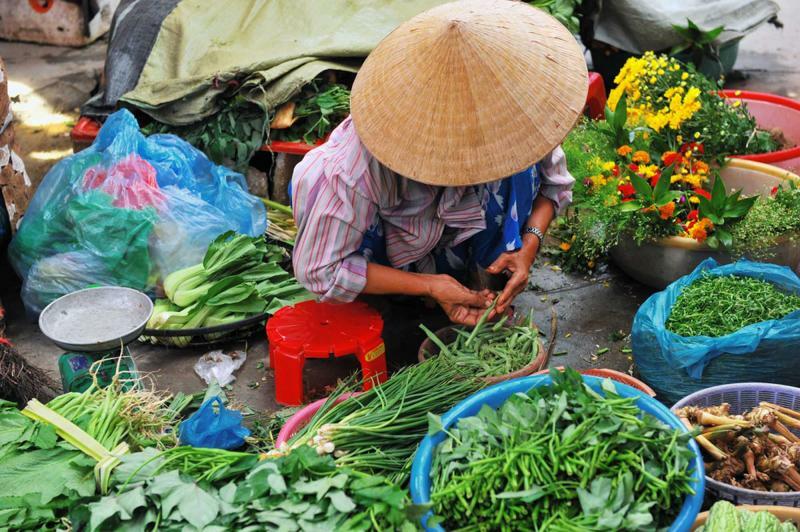 Enjoy vacationing in Vietnam on this custom tailored tour that will take you through the culture and landscape that creates this unique, unparalleled country. 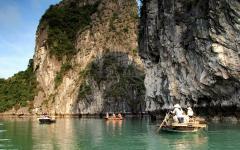 From the impressive karsts of Ha Long Bay to the stone Mandarin soldiers that guard the old imperial emperors of Hue, whether situated on a mountain peak overlooking the sapphire water of the South China Sea or strolling along the paper lantern lit streets of Hoi An, you will be introduced to Vietnam and will discover its majesty. 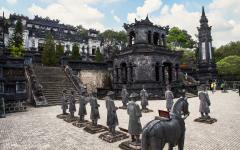 Your introductory tour begins with your arrival in Hanoi, the capital city and a collective of culture. 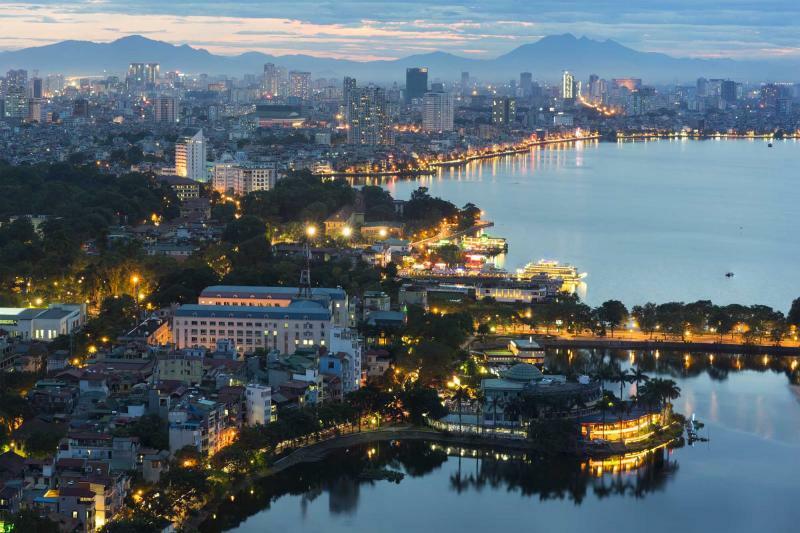 Whether within the joyfully dizziness of the modern skyline or along the calm, traditional banks of the Hoan Kiem Lake, you will find the neighborhoods and people of a city that has captivated many who came before you. 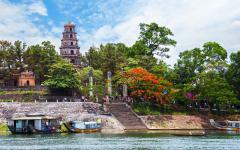 The following day you will arrive in Hue, the former capital of Vietnam dating back to the 19th century. Spend your time exploring the Perfume River and the surrounding mausoleums; from the famous Citadel that continues to house a large collection of the population, to the tomb of emperor Tu Duc, you will find the opulent history pressed against a more modest modernity without having sacrificed history. Your discovery continues within the Demilitarized Zone of what continues to be Central Vietnam. The open space is filled with reminders of the Vietnam conflict, from tanks to bunkers, creating a sense of what life at the time was like for those living within the country. Once in Bach Ma National Park you can spend the next two days traversing the mountains, basking along waterfalls, and enjoying the view that once had French Colonials vacationing in the hills. 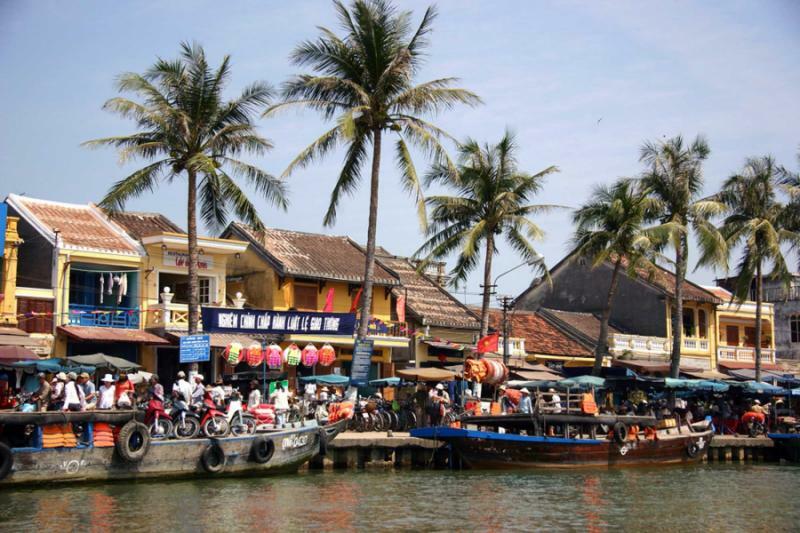 The next three days will be spent enjoying the charisma of Hoi An, a city set on the Thu Bon River and which grew out of an opulent merchant connection in the 16th century. You will also have the opportunity to visit the Cham Temple complex of My Son. On your final day you will have a private transfer to the airport to make your flight home. 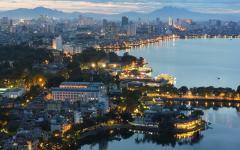 Welcome the city of Hanoi, the capital of Vietnam, a place that combines serenity and energy with ease. Your private transfer meets you at the airport and soon you are settled into your accommodation within the center of the city. The French Colonial influence is apparent within the buildings of the Old City, and in its wide streets which allow waves of motorbikes to pass in consortium with bicycles carrying large, shallow baskets filled with vibrant fruit. Full of a millennium worth of history, the cityscape brings both modern luxury and tradition to the forefront of understanding, whether within the elegant architecture of the Opera House or on the tranquil shores of Hoan Kiem Lake. 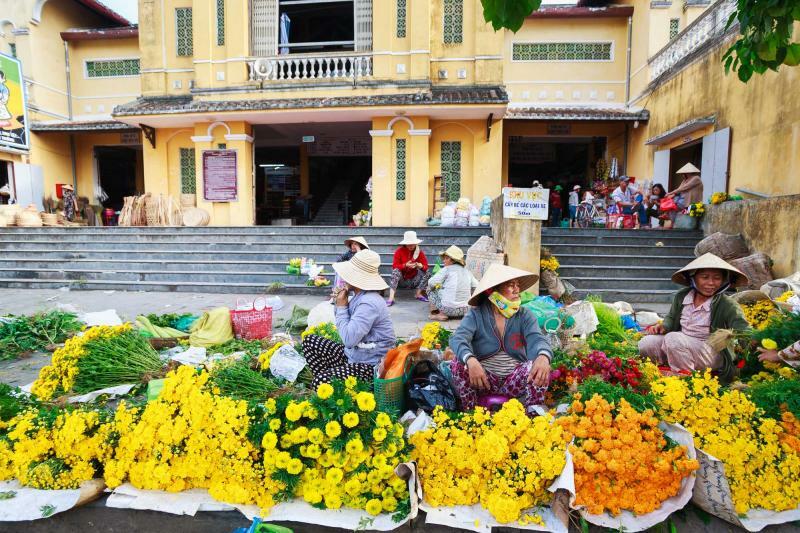 Within the three-story halls of Hang Da Market you will find a diverse collection of culture and industry, where imported wine stores mix with local flower shops, and second-hand clothing stores stand next to textile stalls. The exterior is a remarkable multi-perforated façade colored in opulent white and is often filled with the aroma of freshly cooked snacks rising from the first floor. Paper lanterns glow superior hues in many shops, illuminating the goods and the walkway. You can hear the exotic birds chirping all the way from the store on the north corner. If something strikes your eye remember that haggling isn’t just encouraged but expected. In the morning you will have a private transfer to the airport where you will soon find yourself in the former capital of Vietnam and then on to the Imperial City of Hue. 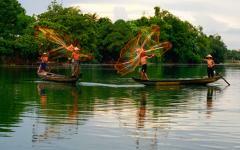 The Perfume River is a remarkable waterway that winds around the lushness of forests and mountain slopes. Step onto a dragon boat, where the bright hues of the smiling dragon bring luck to its passengers and scares away the malevolent spirits. The water is calm and the breeze is cool as you cruise through the tranquil water surrounded by stunning landscapes. You come to the celebrated Thine Mu Pagoda, known for its history during the Vietnam conflict and its beautiful concentric, hexagonal architecture. Climb the steps that take you through the four pillars framing the seven-story structure and which bring you to the base of the temple towering over the riverbank and the open courtyard. The modest temple stands within the plaza, home to a bronze laughing Buddha image. 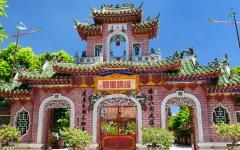 There is an exquisite charm within the temple complex that welcomes you to the Imperial City. The day is filled with another burst of splendor predicated upon the city’s great history. Your private guide will take you through some of the open beauty that is associated with the tombs of old emperors, filled with opulence on a grand scale to commemorate the leaders in life and beyond. 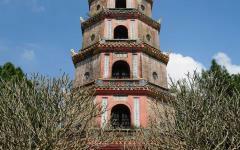 The Tomb of Khai Dinh is located on a hillside and brings together Vietnamese and European elements. The entrance marks the beginning of a large staircase that rises to a tripartite gate, the center entryway once reserved for the emperor Khai Dinh. The concrete and stone are blackened along the exterior giving a particularly gothic ambiance to the complex; however, the interior sings with an explosion of color from its rich mosaics. Within the Honor Courtyard you find Mandarin honor guards immortalized in stone guarding the tomb and watching out over the open plaza, each one unique in their own way. The atmosphere is compelling, lavish and tranquil. The imperial past is strong and looming over the city that brings with it so much architectural and artistic artifacts from the museum and the standing remains. Today you will follow your guide through the famous citadel where walls thicker than six-feet and which span over six-miles sit on the north bank of the river. Constructed in the 19th century, the fortifications were surrounded by a large moat. The modern walls now house a large portion of the city’s population. The aroma is a sweet mixture of the surrounding trees and the rich scent of bun bo Hue, a rice noodle dish filled with flavor and aromatics. There is bustling life within the gates, filled with tradition and mixing with the modern markets of today. You can see the Nine Holy Cannons near the Flag Tower, each one over 15 feet long. The forbidden city once stood at the center of the complex where only the emperor was allowed to enter; however, during the Tet Offensive in 1968 the central area of the citadel was destroyed leaving only the gates and the courtyard remaining. After breakfast you will be met by your private guide and taken to an area that was once known as the Demilitarized Zone. Within the peaceful walls of the Khe Sanh Combat Base your guide will inform you of the history of this place; in 1968 the hillsides were said to have trembled with war. The open space sits within the sprawling mountains and abundant greenery. The remains of the past are on display as well, from the large tank standing near the tree line to the remaining helicopters situated quietly on their pads. A small museum further offers insight into history in the form of old photographs and reconstructed bunkers. The aroma of coffee plantations rushes along the foothills. Near the base you will also find the town of Vinh Moc which literally went underground during the conflict by creating a series of impressive tunnels. Over 90 families created over one and a half miles of tunnels stretching over three levels. Follow your guide through the labyrinth where the cool air of the tunnels relieves the tropical heat and where you can experience the depths at which the villagers burrowed to ensure their survival. Today you leave the history of the Demilitarized Zone behind you for a sensational journey into the stunning nature at Bach Ma. The mountain range sits at the edge of the South China Sea giving you access to both the tropical reaches of the forest and a view to the sapphire water below. The highest peak is over 4,350 feet above sea level where birds chirp and sing, and the trees sway in the breeze. 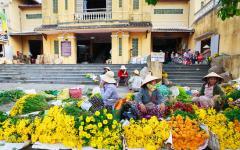 What was once a French resort area is now home to conservation efforts that allow you access to the trails and walkways brimming with colorful flowers and active wildlife, from river otters to iguanas, and combining the best features of both North and South Vietnam. In the distance you can hear the power of a waterfall careening down the mountainside. Your guide brings you to the edges of the precipice where the water forms a wave down the rocky terrace. You look out over the open mountain range witnessing the majesty of nature within the sights, sounds, and aromas of the day. The morning washes over the mountain range with bright light and the sweet songs of the birds calling from beneath the canopy. The first half of the day is yours to enjoy the nature on grand display all around you. 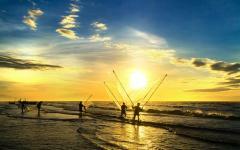 Whether you prefer to stroll through the trees or venture on a more challenging hike which will have you overlooking the edges of the South China Sea. After breakfast, much of the day is at your leisure. The cool early hours shift into the warmer afternoon bringing comfortable shade and fabulous hues beneath the sunlight. 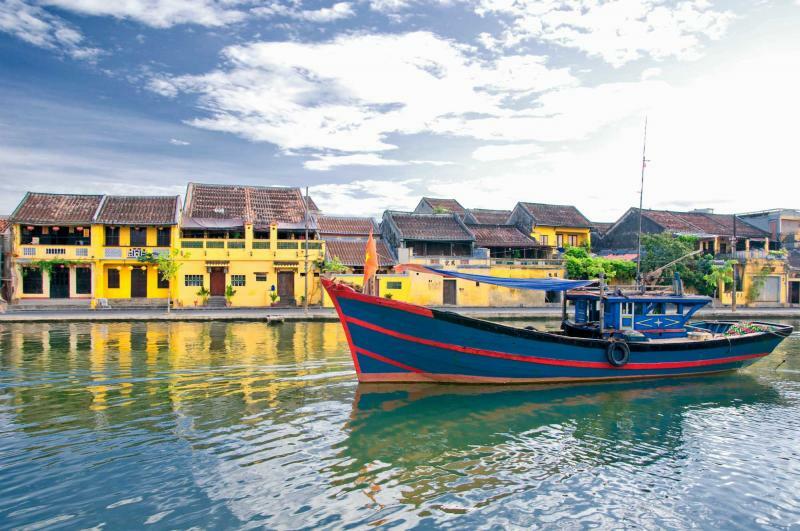 You are met by your private transfer and taken to the charming city of Hoi An, where the merchant past shaped its quintessential present within the elegant architecture and sleepy town atmosphere. 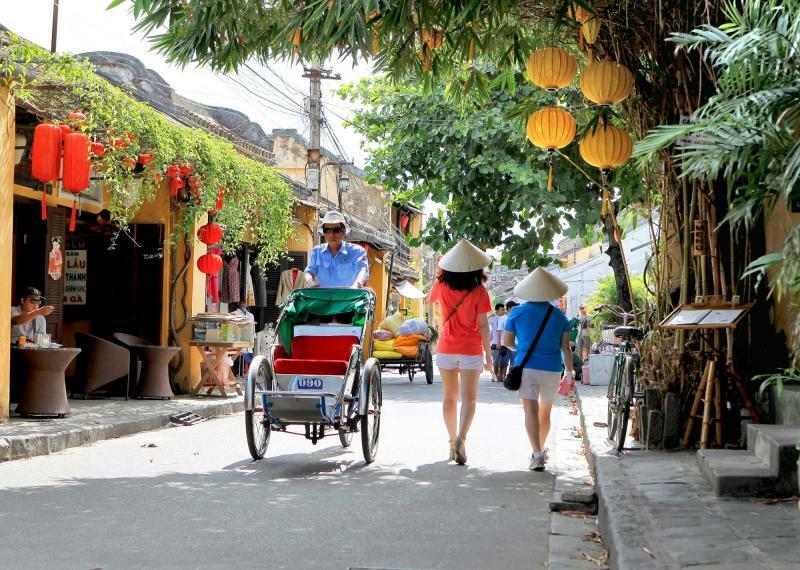 The ancient city of Hoi An sits along the quiet Thu Bon River with the charm and elegance of history displayed in the soft sway of the Chinese lanterns which drape across the main streets. 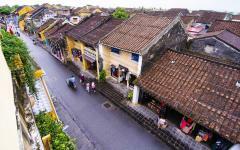 The city was once the center of trade for silk, porcelain, pepper, and cinnamon dating back to the 16th century. After breakfast your guide will take you through the streets that make the town feel more like an outdoor museum than a living, breathing, working city. The Japanese Covered Bridge has become an icon of the city. The structure reaches over the riverbed in a lovely artistry featuring sloping, tiled roofs and statues paired on either side of the entryways, monkeys on one and dogs on the other, both guarding the bridge from intruders and spirits. When visiting the Tan Ky House you will come to the quintessential building that stood during the heyday of the city’s trading. 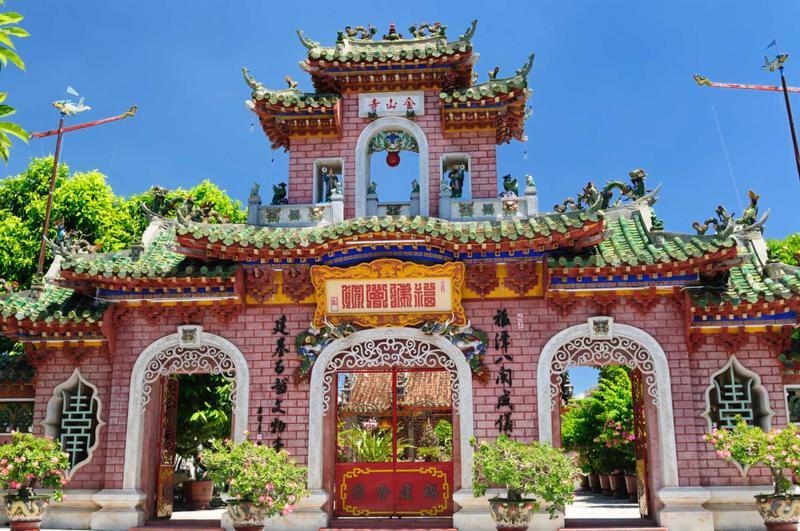 Constructed by a Vietnamese family over 200 years ago, you can still find Japanese and Chinese influence in its architecture, from the ceiling along the sitting area to the delicate Chinese poems inlaid on mother-of-pearl and hung from the various columns that support the roof. The back of the house faces the river and was once rented to merchants, allowing them access to the waterway which was once the most prosperous point of the city. 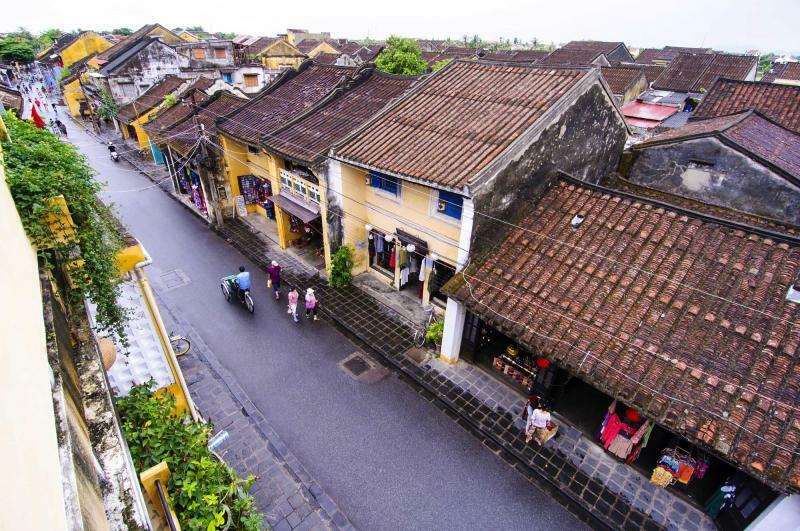 Although the streets are filled with locals and visitors alike, the quaint buildings and lavish history create a charming atmosphere that is hard to ignore and impossible not to enjoy. The day is yours to explore the city or surrounding countryside as you prefer; however, if you choose to enjoy an excursion to the My Son temple complex you will experience the intricate wonder of ancient architecture which has endured through regime changes and has survived the elements. After breakfast your private guide will bring you to the UNESCO World Heritage Site that dates back to the second-century. The Hindu-themed ruins offer impressive and stunning sculptures set like a movie within the tropical jungle. Temples and towers rise above the trees in the open plaza and looked to have been forgotten through time. The red stones stand out against the lush jungle backdrop where mountains undulate along the skyline. The scent of trees and warm earth lingers in the breeze. 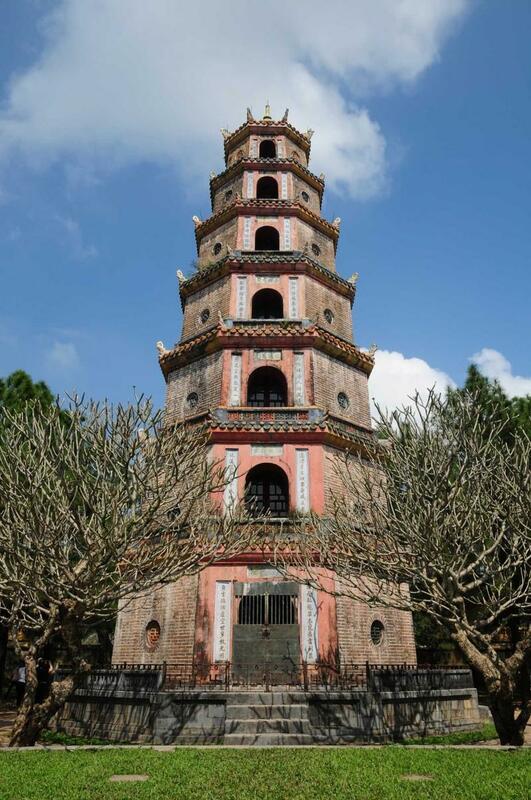 The Cham architecture showcases a solid tower base, sacred tower body, and top built in the shape of a man making an offering, each level representing a different tenant of belief. The serene sounds of the complex are only enhanced by the gracious animal calls of the jungle, from chirping birds to swaying branches. 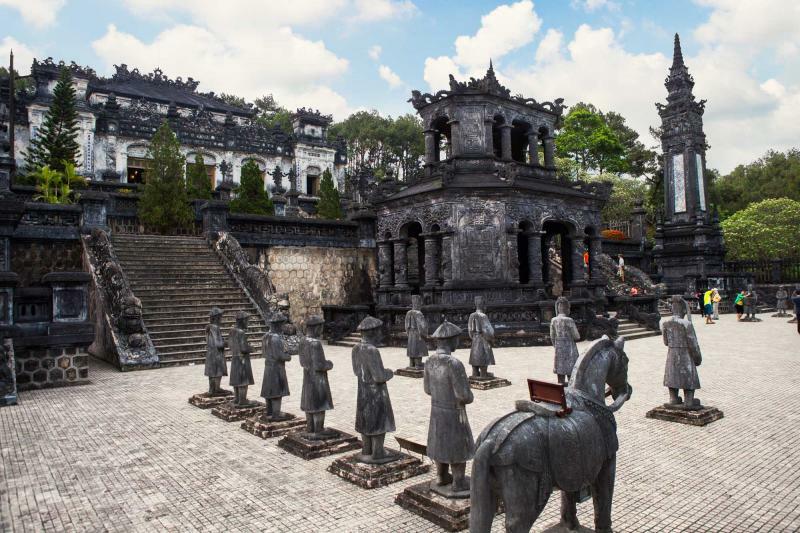 As you come closer to the temples you will be able to see the intricate detail that lies along the sides of each temple, where the statues of men, gods, demons, animals, and legends are carved into the now coarse stone. Today brings the calm sounds of the Thu Bon River which continue to make their way through the center of town. You spent your last evening strolling along the gentle light of the main streets that emanated color from the paper lanterns gracing the roadside. Today you will once again have a private transfer to the airport where you will begin your journey home. 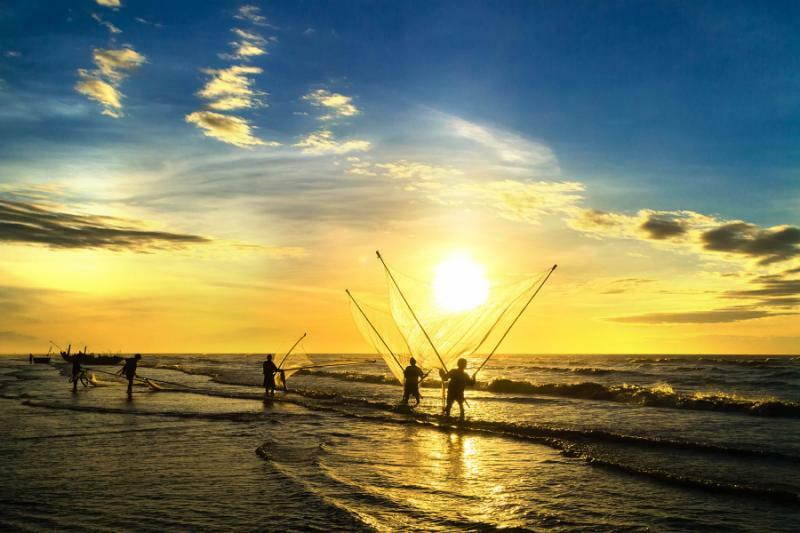 Your time in Vietnam has introduced you to the natural and manmade majesty that fills the countryside and the cityscape, from culture to skyline, mountains to karsts, and has given you a tremendous introduction to all that Vietnam is and can be. 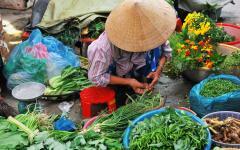 Browse the Vietnam tours reviews for additional ideas on how to customize your trip. 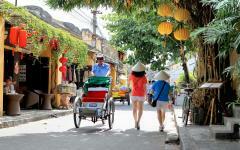 "My family loved everything about Vietnam: the culture, the food, the museums, and the people." 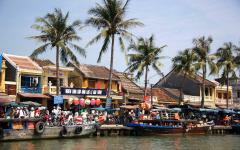 "Our agent did a masterful job on our tailor made trip to Vietnam."